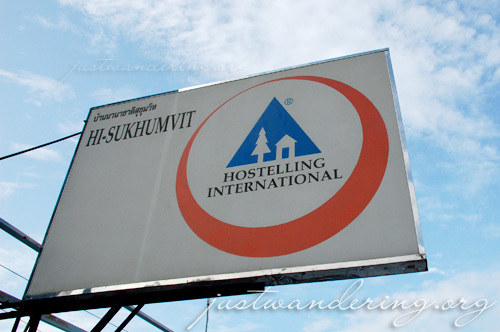 Hostelling International Sukhumvit is one of the hostels in Bangkok getting high ratings from travelers who have stayed there. I’ve stayed there twice in 2009, and it’s getting high rating from me as well. The Sukhumvit area is called the embassy row — almost all of the embassies are located there (including the Philippine embassy). 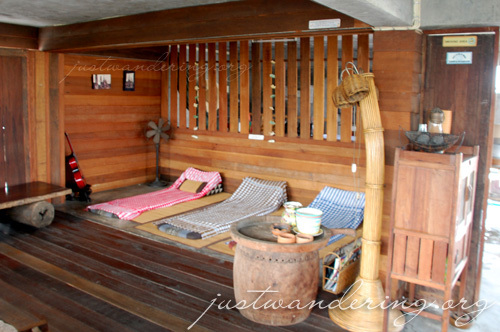 It’s also said that Sukhumvit is where backpackers go when they tire of Khao San Road. Sukhumvit is a very quiet neighborhood, and you can walk for a kilometer without anybody asking you if you want to go on a tuktuk ride or buy a fake Rolex. Though Sukhumvit is not exactly a central station, the BTS run along the main road, so it’s easy to get around without having to deal with Bangkok’s infamous traffic jams. HI Sukhumvit is located in Sukhumvit Soi 38, a street of the main Sukhumvit road. It’s actually tucked in a smaller street, just 100 meters from the entrance of the street. The nearest BTS station is Thong Lo. The hostel has five floors, the fifth being the roof deck, where there’s a common lounge room, sun beds and the laundry facilities. The rooms range from female and mixed dorms, single and double rooms, and rooms with ensuite toilet and bath. There is no elevator in the hostel, so be sure that you can comfortably carry your luggage up a flight of stairs if you’re staying here. Each floor has a shared toilet and shower. The housekeeping staff are always around ensuring that the toilet is kept clean and there’s toilet paper available. 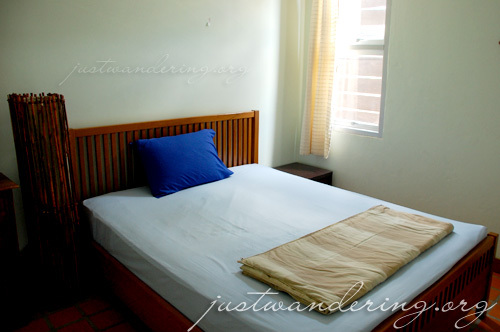 During my first stay at HI Sukhumvit, I booked a single room. Due to the guest extending his stay, they gave me a double room for the price of the single room. The room was big enough for two people without bumping to each other. The bed was comfortable and the pillows were soft and fluffy. There was a clothes rack for drying wet towels or clothes and a small dresser for your toiletries. There’s also a side table and a lamp, which is great if you’re going to read before sleeping. The second time I stayed there, I stayed for one night in a 4-bed dorm room that I shared with the tennis girls. It’s roughly the same size of the double room, with two bunk beds and four people. The beds are comfortable enough, but I’m glad that the pillows are the same soft and fluffy kind as they have in the double rooms. One of the things you may not like about HI Sukhumvit is the aircon policy. There was a note at the door saying that air conditioning is only available between 6pm to 11am. The aircon is not centralized, so I’m not sure if they really monitor the usage of the air conditioning in every room. This can be terribly inconvenient if you’re staying the whole day at the hostel, but if you’re going to be out the whole day sightseeing and shopping, this shouldn’t be an issue. Wi-fi internet is available to guests for free THB100 for the entire duration of your stay. In the website, they said that wi-fi is only available on the ground floor, but from experience, the signal can reach up to certain rooms on the 3rd floor (the rooms on the left side of the stairs as you come up). I was able to access the internet on my rooms at the 2nd and 3rd floor (though signal is sometimes choppy and I had to resort to put my laptop on the floor for optimal signal strength), but I wasn’t able to get any signal on our dorm room on the 3rd floor. There are also desktop computers you can use if you don’t have a laptop, but they charge for usage. They turn off the Internet at midnight though, so better keep that in mind if you need go online. On the ground floor, there’s a dining table where you can have your meals or work on your laptop. There’s a small area with a collection of books that other travelers have left and a variety of magazines and board games. There’s also a cable tv, and an outside seating area where you can smoke. Also on the ground floor is a small room under the stairs where you can leave your luggage before check-in or after check-out, and a kitchen where you can prepare and cook your meals. There’s also a huge map of Thailand and Bangkok to help you plan your trip within the country. There are also suggested itineraries, and the reception can help you book tours to popular tourist attractions around Bangkok. 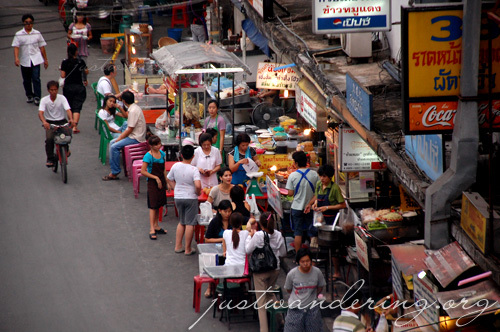 What endeared us the most with HI Sukhumvit was the nightly food market. Every day at 5pm, hawkers would set up their stalls along Sukhumvit Soi 38 and cook up some of the best Thai food at very cheap prices. The food served here aren’t the type that is made for tourists; these are Thai food cooked for Thais. Though HI Sukhumvit is just down the street, majority of the people who eat here are Thais who live and work near the area. Ming, my Thai friend who lives in Bangkok, says that after a long night of dancing and drinking at the clubs, Soi 38 is where Thailand’s partyphiles go. Everything that we ate at Sukhumvit Soi 38’s night market was good, but our favorite was the pad thai from the stall with the long lines (it’s at the first corner from Sukhumvit, on the right side of the road) and the mango with sticky rice on the opposite side of the road. The high rating and glowing recommendations that HI-Sukhumvit has been getting were well deserved. The hostel is not perfect – it’s not wheelchair friendly, the reception is only open from 7am to 12 midnight, the aircon policy. However, it has a lot to offer that makes up for its shortcomings. 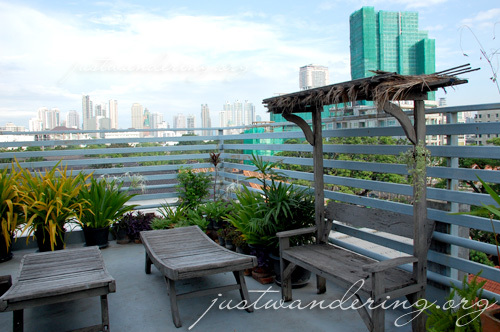 Will I stay in HI Sukhumvit again? Definitely. round two this october? this time with some actual tennis? Your site is always first reference sa mga destinasyon na balak at gusto ko puntahan. I got some tips organizing my itinerary, how to be light packer, listing my travel expenses and more. Your Bangkok entry and Dyanie were a big help, indeed my recent Bangkok trip was successful. I got a very nice, accessible place to stay wherever your destination in the city. Anyways, thanks so much for the letter. Walang duda, Yes I am a fan?. Looking forward to read more entries from you. How much was the dorm bed per night at this hostel?